It is a sandbox game about engineering, construction, exploration and survival in space and on planets. Players build space ships, space stations, planetary outposts of various sizes and uses (civil and military), pilot ships and travel through space to explore planets and gather resources to survive. Featuring both creative and survival modes, there is no limit to what can be built, utilized and explored. In 2002, Marek Rosa got an idea of making a physics-sandbox game where players construct static and dynamic structures in a grid-like environment, with realistic physics and realistic volumetricity. This idea was inspired by his childhood days, spent with the popular construction toys of LEGO and LEGO TECHNIC. Back then the technology wasn’t ready for a full-scale approach, so the first phase of his “master plan” focused only on dynamic voxel terrain. This resulted in our first title, “Miner Wars 2081”. The second phase is happening right now and is materialized in “Space Engineers”. To be honest, for the sake of intuitive gameplay, we had to make a few sacrifices to “realism elitism” - jump drive, artificial gravity, max velocity, reactor efficacy, static grid, immovable asteroids, etc. 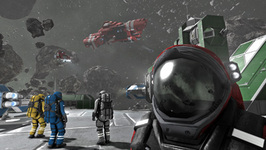 Space Engineers concentrates on construction and exploration aspects, but can be played as a survival shooter as well. We expect players will avoid engaging in direct engineer-to-engineer combat and instead use their creativity and engineering skills to build war machines and fortifications to survive in space and on planets. Space Engineers shouldn’t be about troops; it should be about the machinery you build. Space Engineers is available on Steam. The game was moved out of Steam Early Access on February 28, 2019. However, we won’t stop working on Space Engineers and we feel good about the foundation we have built so far. Like us on Facebook, follow us on Twitter and you will be notified on all news & updates. Space Engineers is the first title fully utilizing VRAGE 2.0, an in-house game engine developed by Keen Software House. "Space Engineers" uses Havok®. ©Copyright 1999-2008 Havok.com, Inc (and its Licensors). All Rights Reserved. "The Most Unusual Online Game"